LOS ANGELES -- When Ray Allen swished a 3-pointer off a Kevin Garnett assist with 2:41 left to play against the Lakers, the Celtics sat on what seemed like a comfortable 94-89 lead. But as the guys in green found out bitterly, no lead -- large and small -- is ever safe against Kobe Bryant. Bryant, now a Masked Mamba, engineered an 8-0 run the rest of the way as the Lakers came from behind to stun the shell-shocked Celtics, 97-94, before a sellout crowd of 18,997 at the Staples Center. Ironically, it was the Celtics who early plotted a big comeback when they erased a 15-point deficit by shooting 13 of 16 2nd quarter field goals. But that rally proved unsustainable as the Celtics 38-of-83 filed goals (47 percent) while the Lakers converted 36-of-71 (50.7 percent). 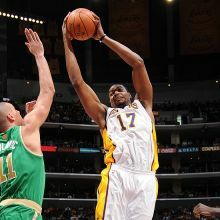 The Lakers sank 8-of-16 triples while the Celtics went only 6-of-17 beyond the arc. Boston had more assists 33-25, but the Lakers enjoyed a sizeable 42-34 rebounding edge. It was thrilling game, one that saw 14 lead changes and 11 deadlocks. In the end, it boiled down to one team playing extremely better in the crunch. "They made shots down the stretch and we didn't," said Celtics All-Star Rajon Rondo, who finished with 24 points and 10 assists. "We had some good looks at the rim, but shots didn't fall and we couldn't get a stop." Bryant, who played for 42 minutes, led the Lakers with 27 points and 7 assists while Andrew Bynum bored through the paint with 14 rebounds and 20 points, including a nifty bucket in the final 15.5 seconds which gave the Lakers a 97-94 bulge. Pau Gasol had another workmanlike performance with 13 points and 13 rebounds while the Artest now known as Metta World Peace made his presence felt with 14 points capped by three 3s.